If you're in need of some cheering up today, try to watch Alex Trebek recite the lyrics to Desiigner's "Panda" without smiling. If you're in need of some cheering up today, try to watch #AlexTrebek recite the lyrics to Desiigner's "Panda" without smiling. It is virtually impossible. During an episode of #Jeopardy, the show that makes you feel ridiculously smart when you know the answer to something, the aptly titled category "Let's Rap, Kids!" appeared on the iconic board. Being the consummate professional that he is, Trebek proceeded to recite the lyrics as straight-faced as he could and it is spectacular. $200: #Drake's "Started from the Bottom"
$800: #LilWayne's "6 Foot 7 Foot"
As the internet does, some creative mind named tole_cover saw the video and decided it would be prudent to cut together the lyrics recited by Trebek to each respective song. The results are editing perfection and suggest future career prospects if Trebek ever decides to quit his job of 33 years. What makes the edit genius is the timing of the lyrics correspond beautifully with the instrumental of the song. Rather than simply overlaying Trebek's recitation on the track, tole_cover meticulously edited it so the rhythm of the host's pronunciations are somewhat equal to how the original rapper spit the lines. 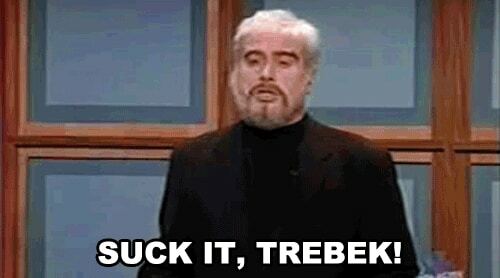 Now if we could just get Trebek to have a dance off against the rest of today's game show hosts we could die happy.